PocketFullOfApps | Nravo Inc. Releases ‘Lightomania’ for iOS! Nravo Inc. Releases ‘Lightomania’ for iOS! Nravo Inc. has announced the worldwide release of Lightomania for iOS, an update to their popular puzzle game which first was available only on the Australian App Store. Lightomania features 54 challenging levels in 3 packs of logical skills tasks that users must complete. Users must obtain 3 lightnings in a certain amount of jumps in order to collect their wings and proceed to the next level. 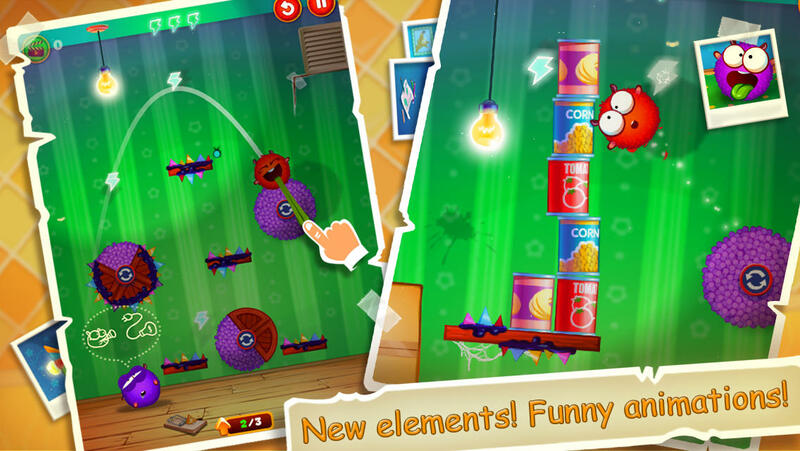 The game also includes vivid animations and the ability to send or receive challenges from friends. In order to steal the light bulb, users pull the tongue of the lightomaniac character, choose the best trajectory and release to jump. If the player is successful, they can move on to the next level and the less moves it takes to complete a level, bonuses are rewarded. Fun, fuzzy duo of comical characters known as “Lightomaniacs”. Challenging quests and rewarding achievements. Ability to send and receive challenges from friends. Interested? You can download Lightomania on the App Store for $0.99 by clicking here, however, there’s a free lite version available as well. Tags: DLC, IAP, iPad, Lightomania, News, Nravo Inc.
← ‘Transport Tycoon Lite’ Released on the App Store! Entries (RSS) | Comments (RSS) | 87 queries in 0.803 seconds.